A unique carbon-recycling system, which can harvest solar energy to transform water and CO2 into liquid fuels, could soon become a reality. Scientists are now exploring this method to develop such a system. According to them, by improving various parts of the system, they can presently drive two-electron chemical reactions, which are a significant development over the energy inefficient one-electron reactions. Published in the journal Nature Chemistry, the study will help those hoping to discover a method to convert surplus amounts of atmospheric carbon dioxide into useful energy sources, stated Prashant Jain, who headed the latest study and is a chemistry professor at the University of Illinois. “Scientists often look to plants for insight into methods for turning sunlight, carbon dioxide, and water into fuels,” he said. When plant leaves are hit by solar energy, the electrons present in chlorophyll are stimulated. It is these excited electrons that eventually drive the chemistry, which converts water and carbon dioxide into glucose. However, instead of depending on biodegradable plant pigments to transform light energy into chemical energy, researchers are now turning to electron-rich metal catalysts like gold, which provides a better alternative. At certain light intensities and wavelengths, gold is capable of transferring photoexcited protons and electrons to reactants without being used up or degraded. For instance, when the nanoparticles are coated with a polymer and suspended in water, they reflect a deep red color after absorbing green light. These nanoparticles, under light excitation, transfer electrons to probe molecules, which subsequently change color. This enables researchers to determine the level of efficiency at which the electron-transfer reactions take place. Researchers have managed in the past to use photochemistry and these light-absorbing materials to transfer one electron at a time. But in the new study, we’ve identified the principles and rules and conditions under which a metal nanoparticle catalyst can transfer two electrons at a time. Jain and his coworkers varied the intensity of laser light employed in the experiments and observed that at four to five times the intensity of solar energy, the gold nanoparticles present in the system were able to transfer a pair of electrons from ethanol to an electron-hungry probe molecule at one particular time. According to Jain, two-electron reactions are much more preferred to one-electron reactions. You need a pair of electrons to make a bond between atoms. When you don’t provide a pair of electrons – and a pair of protons to neutralize the loss of electrons – you end up making free radicals, which are highly reactive and can back-react, wasting the energy you used to create them. They also can react with other chemicals or destroy your catalyst. Jain also informed that experiments which were recently performed in his laboratory using the same system also involved multiproton, multielectron transfers. During those experiments, CO2 was converted to ethane. Compared to methane, which contains just a single carbon, ethane is a two-carbon compound that is more energy-rich. Ultimately, Jain and his team are hoping to produce butane, which has a four-carbon backbone, and propane, which has a three-carbon backbone. From the point of view of chemistry, it’s interesting to understand the rules for stringing carbon atoms together. 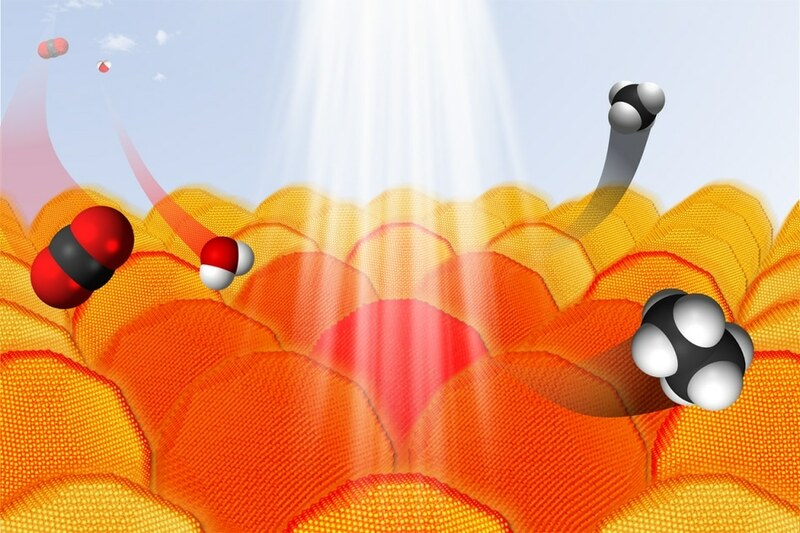 Transferring more than one electron at a time, activating more than one carbon dioxide molecule at a time at the surface of the nanoparticle catalyst can get us access to higher hydrocarbons. Although the latest findings mark a significant step forward, more research is needed before this technology can be applied and scaled up to meet present challenges, said Jain. The research was supported by the Arnold and Mabel Beckman Foundation and the National Science Foundation.